This week we’ve interviewed Amber and Seb from London-based food company BRAVE. I have personally tried their delicious snack and recommend it! 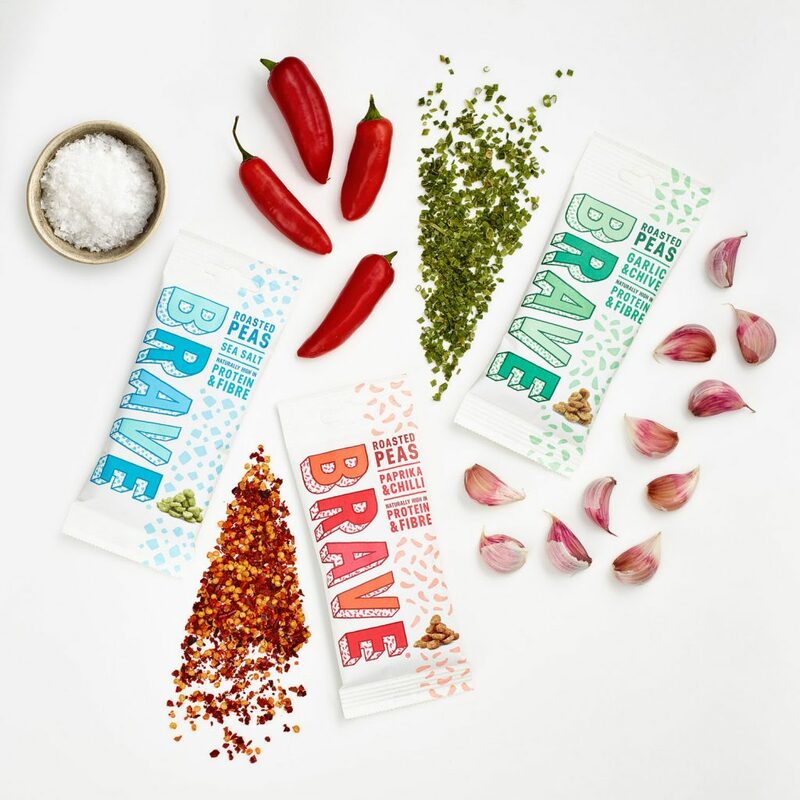 We’re BRAVE and we make crunchy Roasted Peas, a delicious and healthy alternative to crisps and popcorn. Our peas are all grown in the East of England and have more protein than cashews and fewer calories than popcorn. They’re also completely vegan and contain all natural ingredients and no added sugar. We’re based in London and launched in July 2017. BRAVE has two co-founders (Amber & Seb) and we are fortunate enough to have different but complementary backgrounds and skills. While we both studied business at university, Amber’s background is primarily in sales and account management having worked for FMCG brands like adidas and L’Oreal. Seb, on the other hand, come from the world of advertising, having worked for agencies like Wieden & Kennedy, DDB and AKQA. That’s also how the key responsibilities are divided within the business – though both of us are involved in any major decision regardless of what discipline it falls under. We also both always wanted to start our own business so it was more a matter of what and when, rather than if. The idea of building something from scratch and growing it was hugely appealing to us. We’ve both been eating a plant based diet for around 9 years and as a result food is always a big interest for us. Peas and pulses in general are such delicious, sustainable and amazingly nutritious foods and we wanted to find an exciting way to encourage more people to eat these mighty peas! We wanted to start business that encouraged people to make a positive change. That’s where the name BRAVE came from: taking that scary first step towards something better. For us that meant leaving good jobs and going out on a limb to start but it’s applicable to just about anything. The change we want to bring about is a return to healthy and nutritious food, that’s locally grown and doesn’t contain all kinds of strange ingredients in it. We think that’s something other people are looking for and will want to go on that journey with us. Every day is always a little different and we’ve got different ways of working between us, too. On an average day, Amber tends to start the day early (around 7am) and sorts through emails before then she’s out most days meeting customers, sampling and telling Londoners about our delicious roasted peas. Conversely, Seb starts a little later and tries to block out chunks of the day for any kind of creative or strategy work, with emails and follow ups slotting around that. Having space to dive into that work without distractions is key. For both of us Monday’s and Friday’s tend to be in the office, following up with new customers and working other aspects of the business like supply chain and finance. We make sure to align by having a catch-up meeting every morning at 10am to discuss actions and priorities going forward. Otherwise, everything else pivots around what the business requires on that day. We try to schedule meetings either early in the morning or late in the day so it doesn’t cause too much of an interruption and try to finish the day by writing up anything outstanding so it’s there for tomorrow. And working out 3-4 times a week in between helps not only keep us healthy but also sane. The best and worst parts are often two sides of the same coin! Building something from nothing is immensely fulfilling but at the same time, that’s something that you’re out there doing every day, regardless of whether you’re sick, tired or whatever. If you don’t do it, it’s not going to happen. Nobody else is going to do it for you. Likewise, being your own boss is amazing. You’re at the heart of everything and make all the important decisions. But that means ultimately you’re also the one who’s taking all the risks and blame for anything that goes wrong. That’s part and parcel of being an entrepreneur so we try to accept them both as a package and not get too hung up on either. ln no particular order: NPR’s How I Built This, the Foodhub Facebook group, Taste Radio, daily digest’s from Food Dive and The Grocer, Welltodo and FoodBev. We also like audiobooks and can highly recommend Grit by Angela Duckworth, Do Purpose by David Hieatt, and the Hard thing About Hard Things by Ben Horowitz. They won’t necessarily tell you how to start and run a business, but they’re very good at highlighting the mindset you need to have to do it. We use a lot of different things but key to running the business are a bunch of tailored excel spreadsheets that manage things like schedules, production and forecasts. We also use Xero for all our accounting, Illustrator/Photoshop for any creative output and Squarespace to build/host our site. We’ve got two kinds of motivation to get us through the tough times: on the macro scale, we started this business because we’re passionate about healthy and sustainable food. We really, really want to encourage people to eat more plants. That’s the north star that keeps us moving forward and any kind of tangible proof (for example, hitting a sales target) that it’s working is very motivating. On the micro level, we do a lot of our sampling sessions ourselves and there’s nothing better than that moment when somebody’s tried your product and you can see on their face that they like it. That moment right there holds enough energy and motivation to power a week or two. But that would perhaps sell the journey of entrepreneurship short. The truth is, it’s a long, difficult journey and it’s twice as long and difficult to do on your own. Consider finding a co-founder(s) if you’re on your own. That not only reduces the amount of work there is but also creates a dual perspective and tension that’s essential to making good decisions. It’s not a mandatory but most solo entrepreneurs we’ve talked to have said the same thing. Finally, become a subject matter expert in your chosen industry – for example, you don’t need to become a nutritionist or anything like that if want to work in food but you need to understand the market. We read most daily food publications, attended tonnes of food trade shows and talks for years before deciding exactly what we wanted to do. Having your ear to the ground will help you see opportunities in what is unusually a rapidly changing landscape. It’s a toss up between Simon Mottram or Giles Brook. Simon’s done an amazing job building Rapha and arguably singlehandedly made cycling look cool. Giles on the other hand has had incredible success with Vita Coco as well as Bear (and others!) – when it comes to food brands he has a Midas touch! To learn more about Amber and Seb’s company please visit Bravefoods.co.uk and on Instagram. Today we feature Jacob Thundil from Cocofina who was featured on the British entrepreneur show Dragons’ Den. I run Cocofina a coconut company. 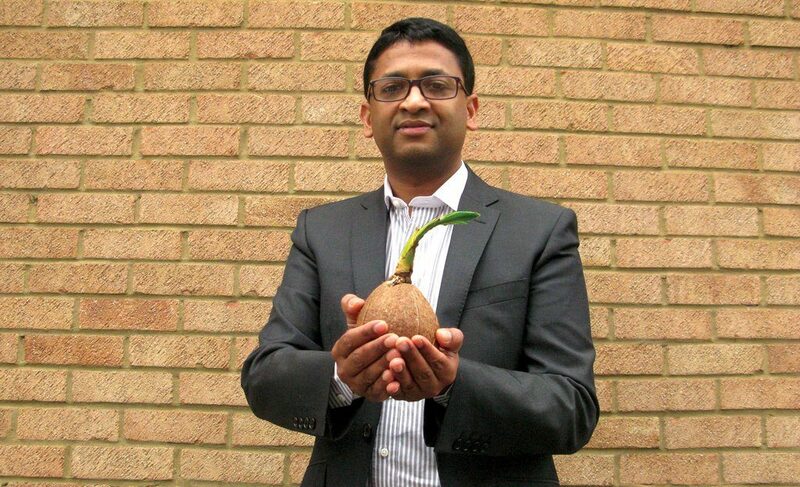 We produce a range of 30 products with coconut. All of our products are 100% natural and majority of them are organic. I started 11 years ago and we are based in Eastcote. Tell us a little bit about yourself and your background. What inspired you to start this business? My colleagues are the most invaluable resource. Start small and be quick don’t be afraid. Often when you have a job and you leave it start a business it can be lonely but this is a temporary phase. Life is game make sure you have enough lives left to play to cover for the mistakes you will make early on. In the early stages try to favour variable costs over fixed costs and have enough money to be able to live in case everything goes badly. How was your experience in Dragons’ Den? What would be your advice to other people want to appear? My experience on Dragons’ Den was amazing although you see 15 minutes on TV we were in the Den for 2.5 hours! My advice would be prepare and be yourself. I am currently reading the Barefoot Spirit. Its an interesting story of a couple who built a very successful wine business with lots of business lessons. I visit the gym twice a week and cook afterwards with my 15 year old son its our time to catch up. I like going out to eat and travelling. Tell us some fun facts about you or your business! All the products originated in my kitchen. At any time there is at least 50 products which were made in the kitchen and not taken into production. What is the best business decision you’ve ever made? The best decisions were to wait to appoint distributors in the various countries. In the early stages we were not attracting the right calibre of distributors. What’s your fondest memory working on this business? Visiting Japan for a trade show. We had so much fun experiencing a new culture. Tell us more about the “Great Taste Award”. Do you need to apply to get it and do you think it helps sales? You need to apply and they close the application when it gets to 10,000 products, Panels of judges judge products and awards and given out. It helps sales since consumers recognise it. We plan to make Cocofina a global house hold brand name! To learn more about Jacob’s company please visit Cocofina.com. Today with interview the people behind Huel who manufacture powdered food. Huel is a nutritionally complete powdered food startup. The idea for Huel was first thought of in 2012, but but sold our first batch of Huel in June 2015. We’re currently based in Aylesbury. How did you come up with the name Huel? Huel, is created from a combination of the words Human and Fuel. The idea came from when the co-founder, Julian Hearn, was on a diet plan for a former business of his. He had to stick to a strict diet to make sure he was getting all the nutrients his body needed, but found that making sure you got them all, and having all the time to prepare them, was a “nightmare”. That’s why he created Huel. It takes two minutes to prepare, and has 100% of the vitamins and minerals your body needs to thrive. People can gain or lose weight, eat healthier and save time all in the knowledge what they’re eating is sustainable and healthy. The formula was created by our nutritionist, James Collier BSc (Hons) RNutr, who has 25 years working in nutrition, includes working in the NHS as a clinical dietitian for over 7 years covering an array of clinical areas, where he worked with people with a wide range of ailments and is co-owner of one of the world’s most popular bodybuilding forums, www.MuscleTalk.co.uk. He carefully created it to make sure Huel was a nutritionally complete powdered food, containing all the protein, carbs, fats, vitamins and minerals that your body needs. Indeed, Huel provides at least 100% of the UK Government’s ‘Reference Nutrient Intakes’ and the European Union’s ‘Daily Recommended Amount’. There are too many podcasts to list, but one that we are particularly fond of is Shopify Masters, which the founder Julian Hearn was recently asked to be on. We use the eCommerce platform Shopify, so that is what we use the most. However sites such as basecamp which help create and track tasks people are doing are also invaluable for keeping on top of things. Outside of these, gmail, Skype, and our forum hosting service Discourse are also things we spend a lot of time on. There are currently 7 people directly hired by Huel. However, we outsource a lot of Huel to fulfillment our house, freelancers and the facility that makes Huel, so the number is much higher than that. At least 30 people, probably a lot more. Julian Hearn has previously sold a successful former business of his, so he was able to fund Huel entirely from this. As he has already made his money, this means Huel is much more a project of love than something to make money. To learn more please visit Huel.com. Today we feature a truly unusual business! Christine Spliid from Gathrfoods.com offers energy bars with a twist! 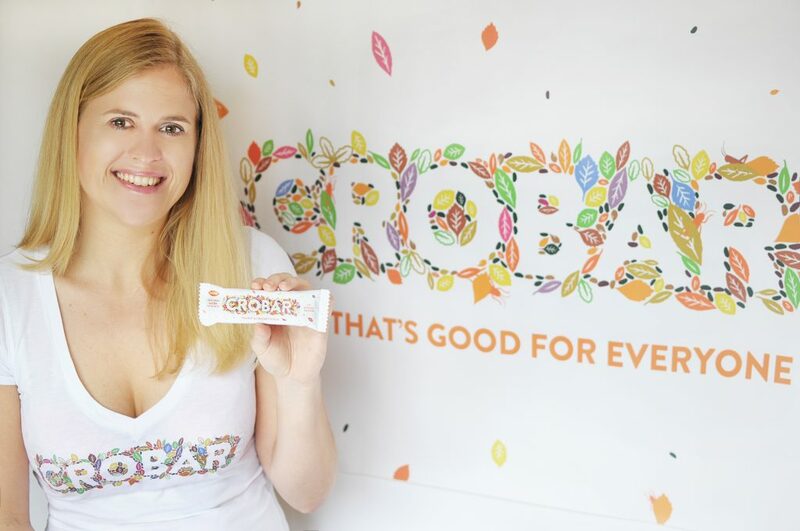 I launched the first insect-based food product in the UK, Crobar, in spring 2015. You could call it a ‘disruptive’ business, as I’m introducing a new protein source which people in the West haven’t eaten before, so I am literally trying to change people’s perceptions and mindsets. I am based in London, and work from home. I have been into health foods for years, and love snacking on new, healthy products. I also love travelling, and it was on my trip to Cambodia that I first tasted insects. After some research into the health benefits, I realised how much more there is to the story, in terms of the huge environmental benefits if we could introduce insects in Western diets on a bigger scale. This is what fascinates me so much and makes this so worthwhile. By launching Crobar I’m trying to make healthy, innovative products, and I’m also giving back and starting something which could benefit the whole planet in the long run. Other than no two days ever being the same, I obviously spend a lot of time on my laptop writing emails. I work mostly from home, but have meetings all over London several times a week. I tend to wake up, check emails, go for a jog, then meetings and more emails. I also like to sit in cafes and work from there sometimes. The best bit is deciding what you want to do and when. If you don’t feel like doing something, you can just do it tomorrow. The worst part is that when things go wrong you feel isolated and don’t know who to turn to because no one knows the business as well as you do. On the one hand I’d say do your research, seek out people who know more than you and learn from them. On the other hand, you also have to just dive into it and do it and take a chance. Too much thinking can mean you make up excuses for not doing it. It’s a fine balance. All you want to talk about is your work, it’s the first and the last thing you think about in a day. I love reading biographies about other entrepreneurs who have become successful business people. It inspires you and you realise they have been through some tough times as well, probably tougher than you. Currently I’m reading the biography of Elon Musk, it’s pretty interesting. I want to launch more insect based food products, such as crackers, chips, bread, pasta. The opportunities to use cricket flour are limitless! The best memory is when the first Crobar came our of the production line. To see something you have been working on for months become a reality was amazing, and I felt very proud. To learn more about Christine’s business please visit gathrfoods.com. Today we feature Barry Honeycombe from More Than Meat. I’ve first encountered his company in London at the Just V Show. Please enjoy the 50th interview! My business is called Plantalicious Limited and our first range of products is called More Than Meat. More Than Meat is just what it says, a plant protein based meat alternative brand that is more delicious and healthier than animal protein meat. After years of yo-yo dieting, I switched to a whole food, plant-based diet and it revolutionised my health. I founded the company to help others make the same positive change to a meat-reducer lifestyle. We blend plant-proteins with wholefoods to make our products, which are made in small batches, using real ingredients. More Than Meat burgers and casseroles are protein packed, zero-cholesterol meals, containing no added fats, no eggs, no dairy and, of course, no meat. My background is not in food. Most of my career was spent selling analytics, helping banks and financial institutions make better decisions through data for risk decisions and pricing. After reading The China Study, I studied for a certificate in Plant Based Nutrition through Cornell University’s online programme. I also used to travel to the US a lot for work and happened to be in California so I took a few days to go to a Farms 2 Forks weekend where I ate the most delicious and healthy plant-based foods and met some of my “food heroes”. I came back from the US and immediately starting following a plant-based diet where I eat nothing that has a face or a mother! I now follow a plant-based diet and then founded my company, as I could not find delicious and healthy plant-based alternatives that were not full of salt, fat and sugar. So, I decided to make my own. It was sheer frustration really. The products that were on the market were not what I was looking for. I wanted something that tasted good but that was healthy. I also missed certain textures and flavours that are associated with meat. For me, a burger should have a degree of resistance and chew; it should not fall apart or be dry. I also love all the flavours associated with lamb, such as rosemary, mint, red currants, red wine etc., hence the lamb casserole. My love of food inspired me to start my company. I am passionate about good food and have always loved to entertain and show my love for my friends and family through food. I am not on a crusade to turn the whole world vegan. I simply want to offer some good food where the proteins just happen to come from plants. 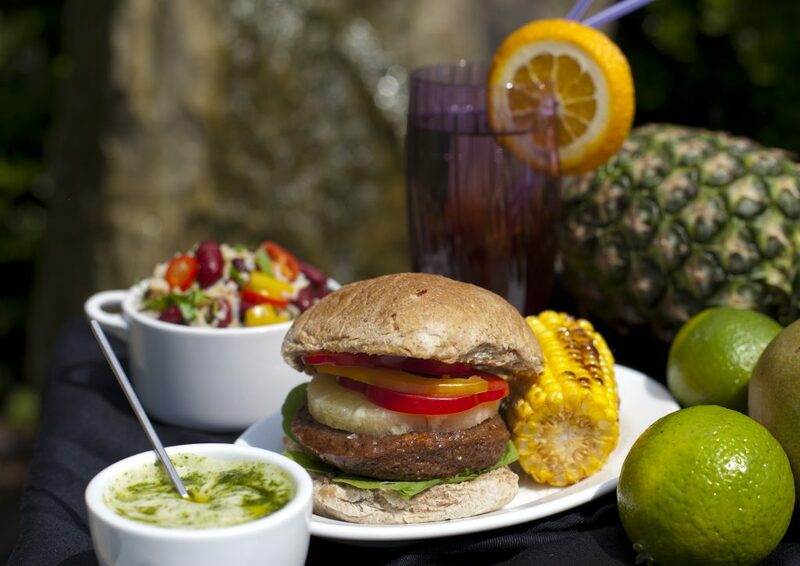 If my food is tasty enough, I hope that my customers will choose to eat more plant-based foods as part of their diet. My motivation and passion is to provide people with products that are delicious, good for them and good for the planet. At the moment it is more of a weekly routine. The earlier part of the week is spent trying to secure new retail and foodservice partners. We have taken a non-traditional approach where we deal direct rather than through wholesalers at the moment. 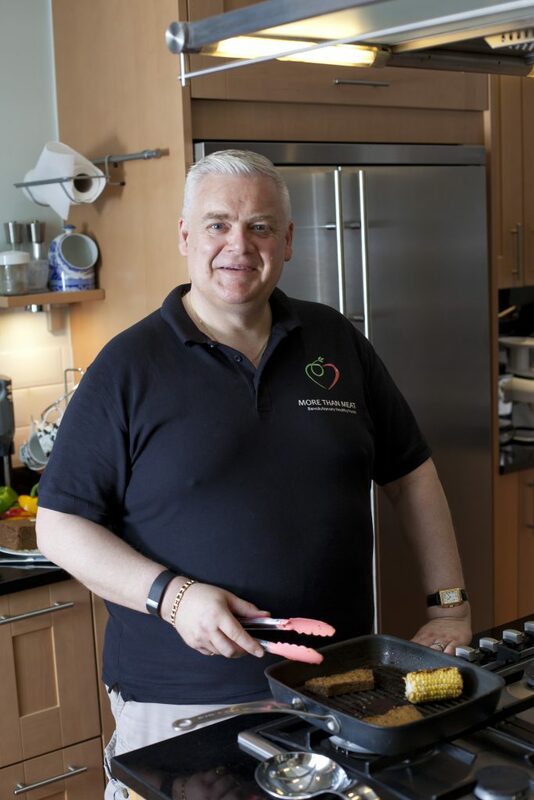 Our online, retail and food service orders are all sent out by courier on Thursdays and my team cook and freeze the products wednesdays to fridays each week. I love those days as the smells drift from the kitchen up to my office! For me, the thrill of someone saying that they love our products, is still the best feeling in the world. Whilst I know that we cannot “please all the people all the time” it really does hurt when someone does not like one of our products. It’s like being told that you have an ugly baby! What is difficult is to acknowledge that everyone is entitled to his or her own opinions and that our products are not for everyone and then to move on. I am someone who takes criticism to heart and I do not find it easy to let go of criticism and move on. Emotions aside, there are a number of key challenges, for us as a small-scale producer. With our products being handmade means that whilst this ensures a quality product, our costs are high and our capacity does have limits. We also need to drive sales as we are an unknown brand and for us it is key that we secure sufficient regular sales to allow us to expand and grow into the company that we are planning. We want the business to be a force for good, be that through supplying delicious and healthy food that our customers love, by having less of an impact on the planet than animal protein based products, and finally by creating an organisation where our employees and partners thrive and succeed. We use Paypal for business (for invoicing), Evernote (order processing and bookkeeping), Skype and Mindjet (for planning). Whatever the chef says goes! To date all of our funding has come from the founder, although as we grow in size, we will be looking for investors. To hire a chef who is as passionate about food as I am. We have a very strong sales pipeline, so we need to look at how we can expand whilst not compromising the quality of our products. By year 5 we will be expanding overseas to markets such as Australia, USA, Canada, Middle East and India. Profit is likely to be in line with the industry average of 5.8% of revenue. Our plans are to clearly call out the delicious nature of our products as well as the positive impact that we will have on our consumers health, the planet and animals. For more information please visit Morethanmeat.co.uk.